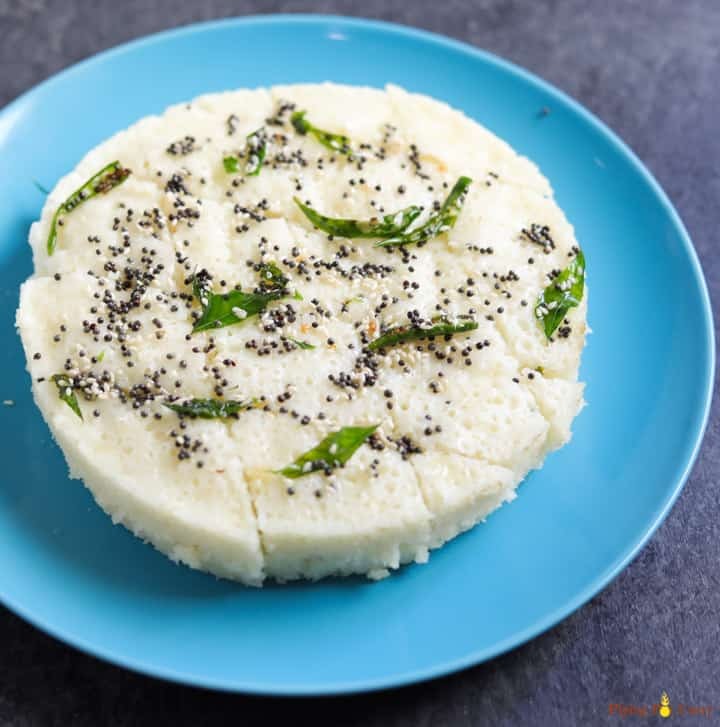 Soft and fluffy Rava Dhokla made in the Instant Pot. These delicious savory semolina cakes are a popular Gujarati delicacy, perfect to enjoy for breakfast or snack! 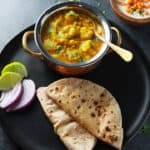 I have been thinking about sharing this recipe since a long time. This is my mom’s recipe to make semolina or Suji Dhokla. 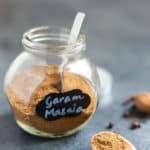 I love this instant quick version, which hardly needs any preparation and can be made in a jiffy. I am sure you will love this Instant Rava Dhokla too! We love to have Dhokla for breakfast with a hot cup of chai. They are little spicy with the addition of ginger and green chili’s and go perfectly with chai! 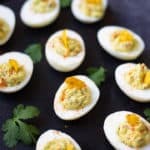 This is also one of my favorites to serve if we have guests over for an evening snack. 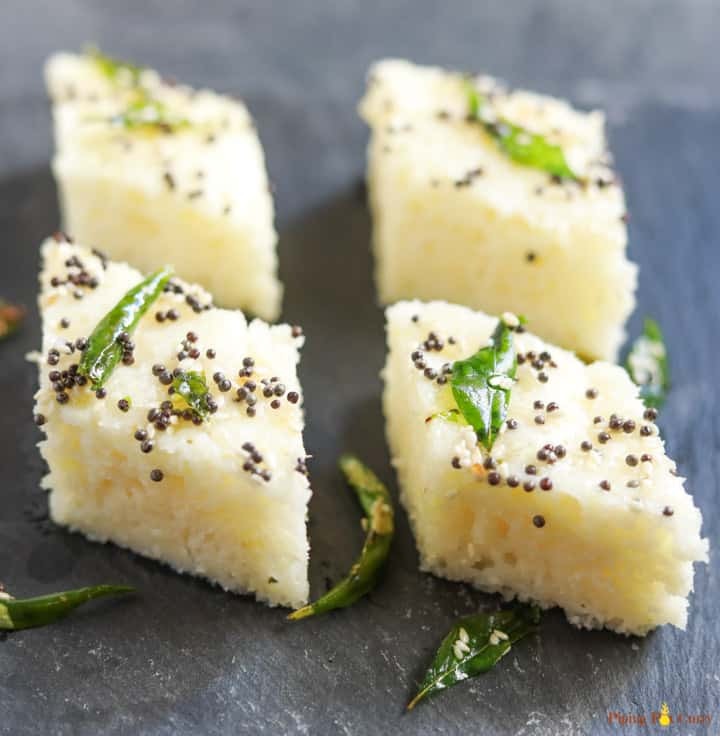 Dhokla, a popular Gujrati snack, is steamed savory cakes which can be made in a variety of ways. 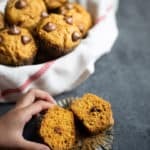 They are soft and fluffy and are a perfect healthy breakfast or snack to enjoy with green cilantro chutney! The 2 most popular varieties are – Dhokla and Khaman. Khaman is yellow colored and the main ingredient is gram flour (besan). Dhokla is white and made with urad dal and rice. 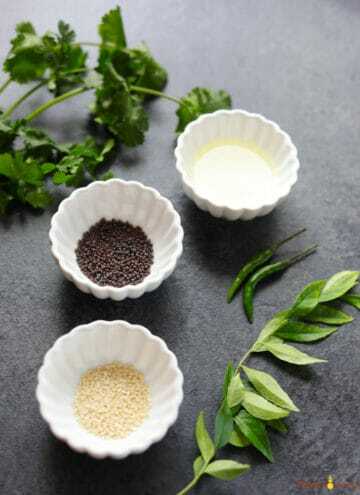 We will make the instant variety of dhokla with semolina, also called Rava Dhokla or Suji Dhokla. This is “Instant” as we will make it without any grinding or fermentation. This dhokla is also known as Khatta Dhokla as yogurt gives it a little sour taste. Or it is called White Dhokla due to its color. Traditionally Dhokla is steamed in a stovetop pressure cooker without the whistle. Or in a stovetop steamer, similar to the one’s used for idli. We will steam this Rava Dhokla in the Instant Pot. Why you will love Dhokla? 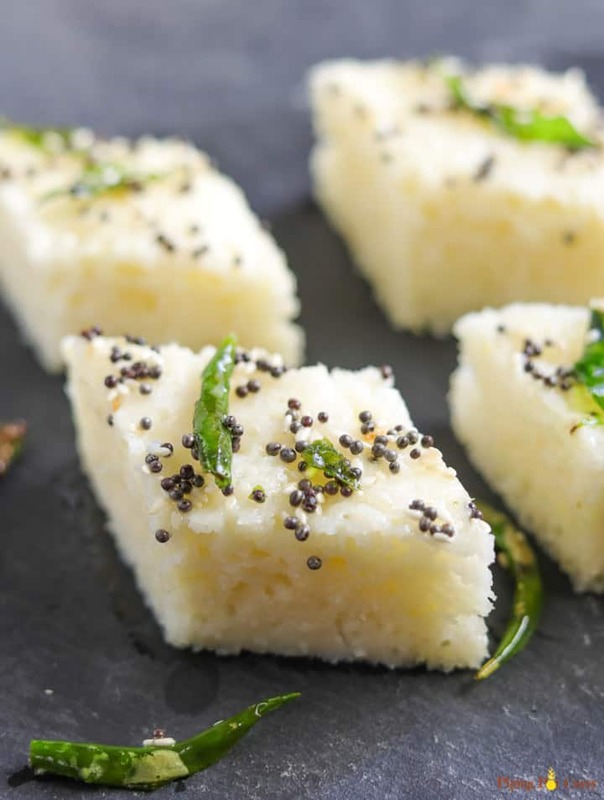 This instant dhokla is quick and easy to make with everyday ingredients. 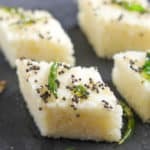 How to make Rava Dhokla? Let’s start with gathering the ingredients. 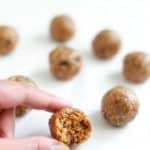 Most of the ingredients are commonly used and easily available in your pantry. One special ingredient is Eno fruit salt, which you can find at indian grocery stores. Some people have successfully used baking soda in place of Eno in this recipe. I have seen the best results with Eno fruit salt for dhokla. 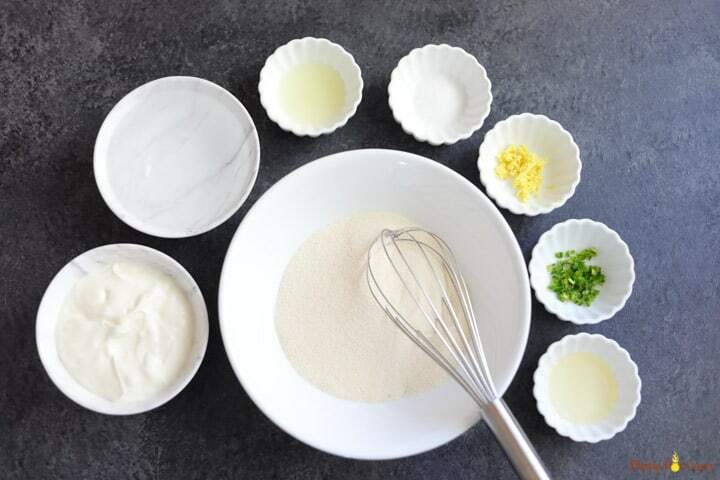 Mix in all of the ingredients, except the Eno fruit salt – semolina, yogurt, water, ginger, chili, salt, lime juice and oil. 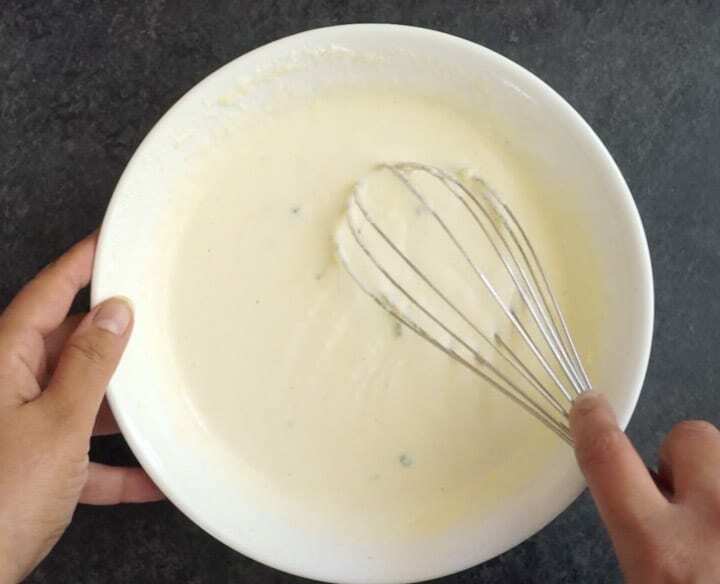 Stir to combine well and let the batter sit for 15 minutes. 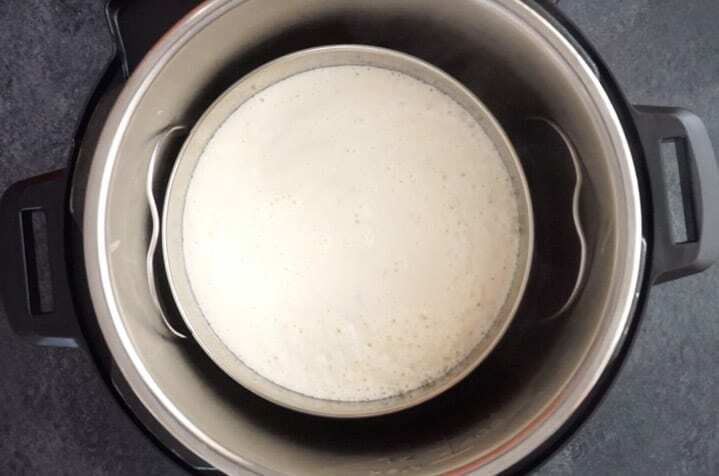 Which the batter is resting, boil water in the pressure cooker on sauté mode. Also, grease the steel pan in which you will make the dhokla with oil. I used one container from the stackable steel containers for the instant pot. After 15 minutes, add Eno to the batter and stir it gently in one direction. 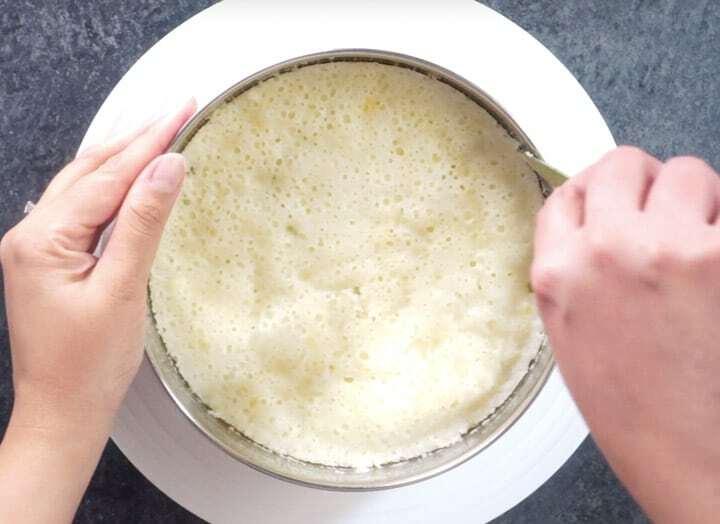 The batter will become frothy and increase in volume. Do not over stir. 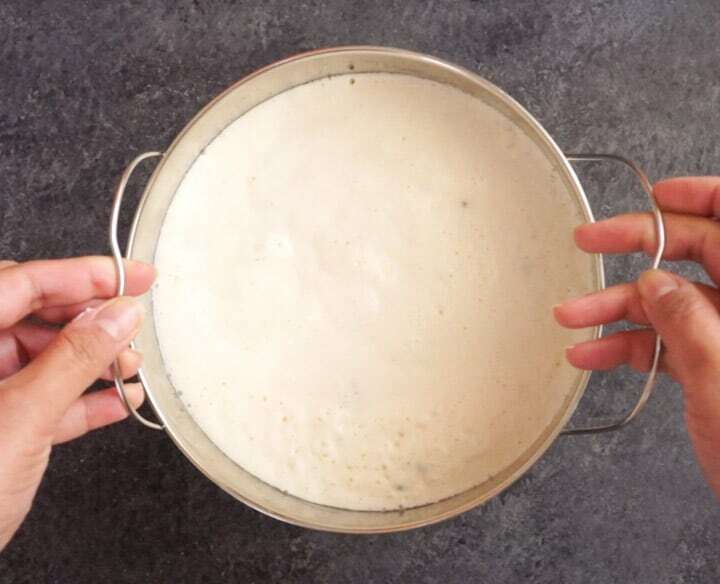 Quickly transfer the batter to the greased steel container and place the container on a trivet. It is important to start cooking quickly after adding Eno to get soft and fluffy dhokla’s. Then place the trivet along with the pan in the instant pot. Set to Steam mode for 15 mins in venting mode. The instant pot timer does not work in venting mode, hence you will need to set an external timer. After the cooking time is done, let the dhokla sit for 5 minutes. Then open the lid of the instant pot and take out the dhokla using tongs. Let it cool for 5 more minutes, so it is easy to remove. Insert a knife or toothpick to check it is cooked. The knife should come out almost clean. If not, you will need to steam for 2-3 more minutes. Run a knife around the edges of the dhokla. Place a plate on top of the dhokla container and turn it upside down. This will help to get the dhokla out of the container easily. Then you can turn the dhokla upside down again on another plate. Gather all the ingredients to make the tempering, while the dhokla is steaming in the instant pot. In a pan on stovetop, add the oil and let it heat on high heat. Then add the mustard seeds and let them sizzle. Now add the curry leaves and slit green chili’s. Let them sauté for about 30 seconds. Add the sesame seeds and turn off heat. 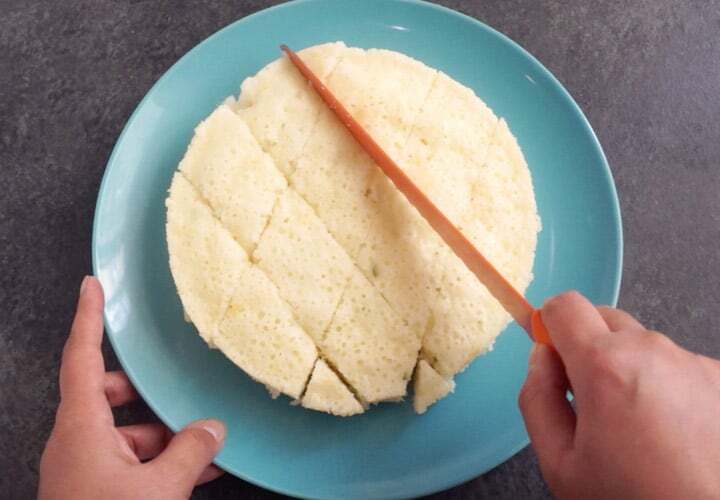 Cut the dhokla into small pieces. Spread the tempering over the dhokla. Garnish with chopped cilantro and serve with green mint chutney. The dhokla is so soft and delicious. We have added some spice with the ginger and green chili in this dhokla, so do adjust to your taste. 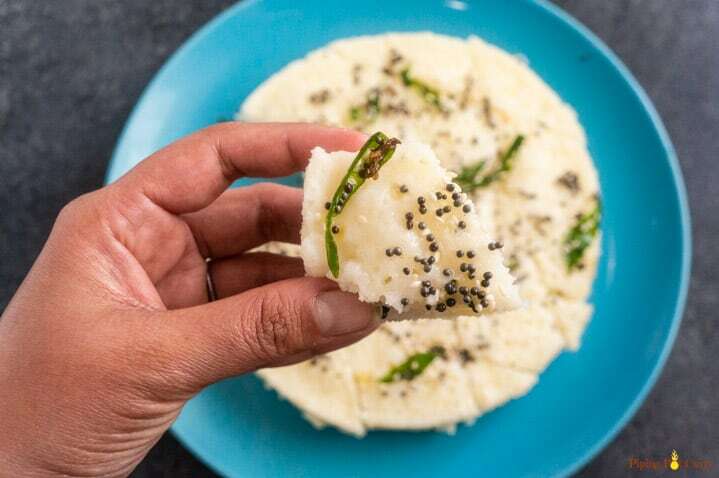 You can skip green chili’s if making dhokla for kids. How to steam Dhokla on Stovetop? Use a large pot that can hold the dhokla batter container. 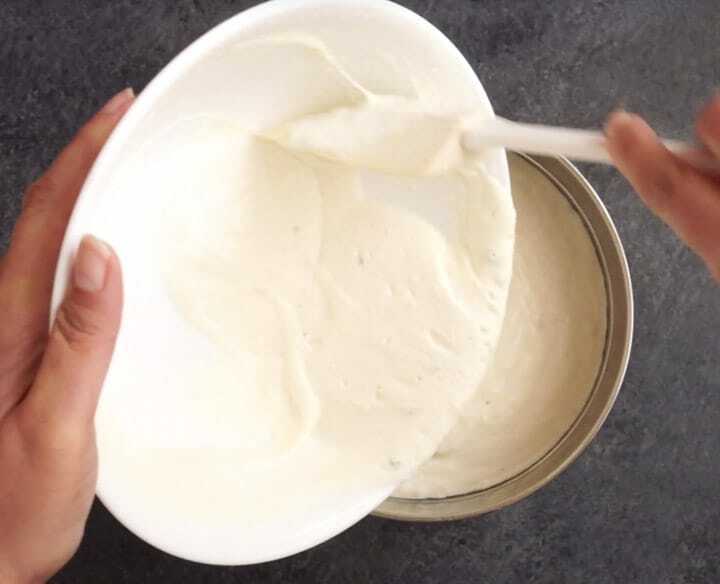 Follow the same steps as above to make the batter. Add 3 cups of water to the pot. Cover the pot and let the water come to a boil while you are making the batter. Place a trivet at the bottom, then place the container with batter on it. Place a lid and cook for about 15-20 mins on medium heat or until the knife inserted comes out clean. In my tests, I have found that Eno fruit salt gives the best results. Baking soda can be used as an alternative in case Eno is not available. I have used fine rava/semolina in this recipe. Coarse rava will work too. 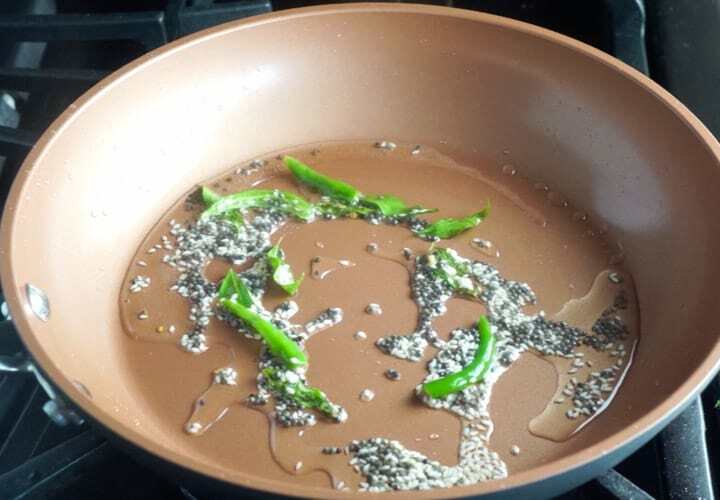 Do not over stir after adding Eno fruit salt. Start the steaming within couple of minutes of adding Eno to get good results. As we are using Pressure cooker in venting mode, the timer function does not work. Use an external timer. You can make this dhokla ahead of when needed. Just warm it in a microwave for a few seconds and it will be ready to serve hot. 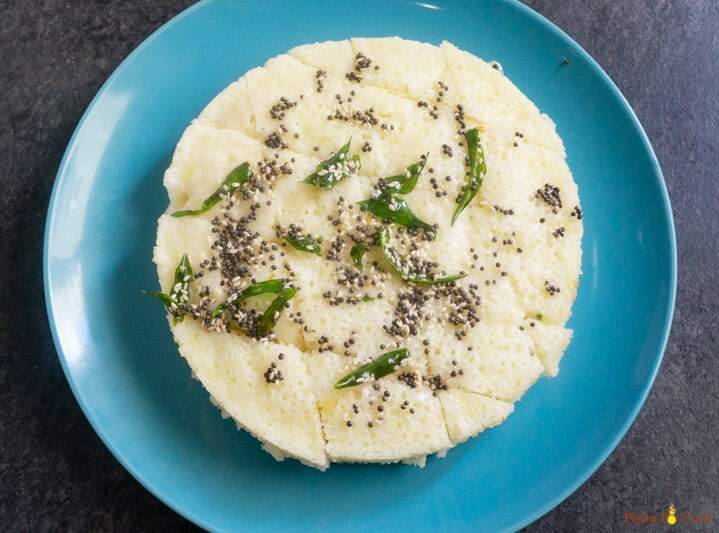 Hope you enjoy this Rava Dhokla for breakfast or snack. If you are looking for other dishes to make with semolina, check out this Rava Upma for breakfast or this Orange Semolina Cake and Sooji Halwa for dessert! 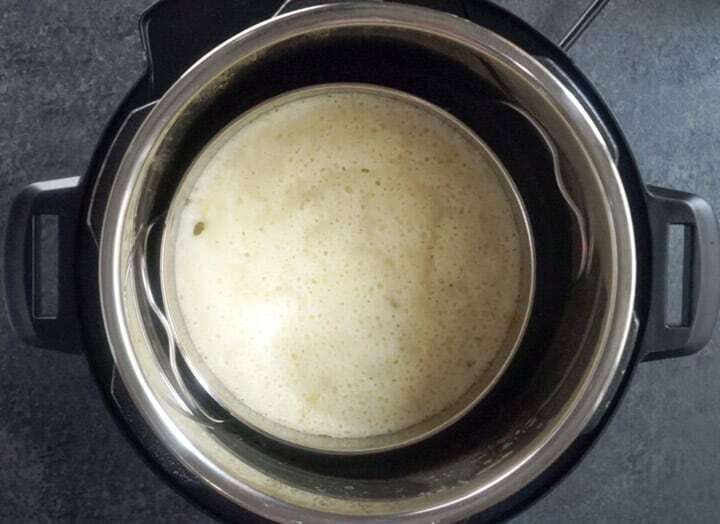 While the batter is resting, boil water in the pressure cooker on sauté mode. Also, grease the steel pan in which you will make the dhokla with oil. I used one container from the stackable steel containers for the instant pot. Then place the trivet along with the pan in the instant pot. Set to Steam mode for 15 mins in venting mode. The instant pot timer does not work in venting mode, hence you will need to set an external timer. While the dhokla is steaming in the instant pot, heart oil In a pan on stovetop on high heat. Then add the mustard seeds and let them sizzle. Now add the curry leaves and slit green chili’s. Let them sauté for about 30 seconds. Add the sesame seeds and turn off heat. Cut the dhokla into small pieces. Spread the tempering over the dhokla. Use a large pot that can hold the dhokla batter container. Add 3 cups of water in the pot. Cover and let the water come to a boil while you are making the batter. Place a trivet at the bottom, then place the container with batter on it. Place a lid and cook for about 15-20 mins on medium heat or until the knife inserted comes out clean. Eno fruit salt alternative: In my tests, I have found that Eno fruit salt gives the best results. 1/4 tsp of baking soda can be used as an alternative in case Eno is not available. Rava/Semolina: I have used fine rava/semolina in this recipe. Coarse rava will work too. Green Chili Pepper: I typically use Thai or Birdeye Chili Pepper for this recipes. Don't forget to adjust to your taste. Important tip: Do not over stir after adding Eno fruit salt. Start the steaming within couple of minutes of adding Eno to get good results. Make-ahead: You can make this dhokla ahead of when needed. Just warm it in a microwave for a few seconds and it will be ready to serve hot.